@Borgnine Cheers man, nice tips about the chaos warriors - I'll have to play around with those ideas when the time comes. Really nice conversions once again - I'm having a hard time choosing a favourite as they're all brilliant in their own way. Love the idea of converting each according to their upgrade too, it's worked really well and created a one-of-a-kind team. @Farmer7574 thanks man! 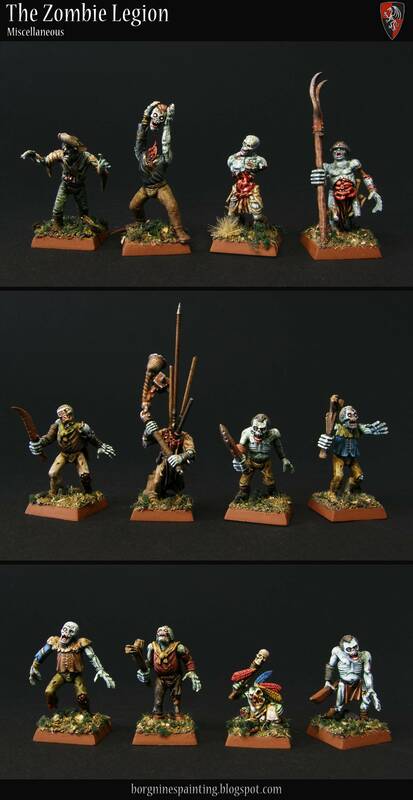 Glad you like them, Chaos and mutations make such conversions really easy and characteful! Now, back to some undead! Finally, I managed to paint my rather unpractical unit of Cairn Wraiths, made out of converted Grimghast Reapers. I built them like this because I always wanted a unit of them, but I couldn't find the right models - and those wraiths were a perfect converting opportunity for that. They required very careful positioning, basing, additional weight underneath and can stand in only one configuration - but they do work! Good to see that it was possible to squeeze an AoS unit into such a tight WFB formation. Unfortunately, the converting process wasn't the hard part, painting all the ghostly bits was. Maybe it was just me, but I really struggled to cover it all without missing anything in a reasonable amount of time. I guess the new Nighthaunt aren't really for me! Still, I am quite happy with how they turned out and must admit that it was all worth it! Also, I finally found a good model to try out verdigris and etheral effects at the same time - something that people have been suggesting to me for a long time. Now I have to consider making more minis like this. Wanting to represent the 'Chill Grasp' rule from the 8th Edition WFB I also painted some frost on their scythe handles, just like I did years ago on my first Cairn Wraith. The whole conversion process and problems related to it are shown in the WIP post HERE. In the ages past, when Daremnych was waging a difficult war with another ancient tribe, he came to the village of Siekerno, asking for help. 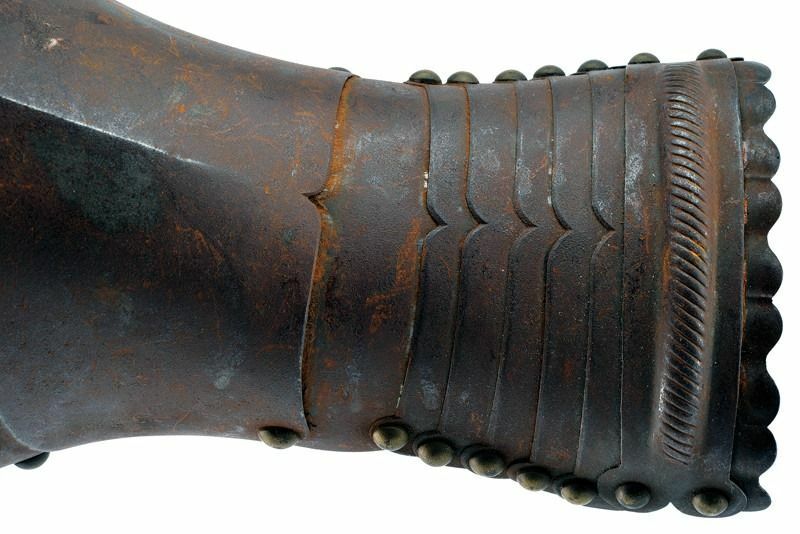 He wanted to ask their well-known and fearsome axemen warriors to sneak through the forest and attack his enemy’s flank during an upcoming battle. The men agreed, but when the time came, they didn't intervene, favoring the chances of the Great Priest’s opponents. Unfortunately for them, Daremnych prevailed through the bloody battle even without them - and came to confront the warriors after that. Already knowing his methods, the axemen of Siekierno fell to their knees, asking for another chance, willing to help and serve. The Priest gave them exactly that - killed them all and bound their spirits to his will, telling them that he will call upon them in the future - only then the axemen will get their second chance and opportunity to serve. Then he captured all the remaining villagers, divided them into small groups and forcibly integrated them into various tribes he had under his command. Now Daremnych, needing an edge against his vampire enemies, came to the forgotten ruins of Siekerno and called the axemen back - to finally serve him as they wanted so many years ago. For the last few months/years I have been slowly collecting miniatures to be used as additional necromances - because you can never have too many of them - and now I finally got around to finish converting/preparing them all and maybe actually get them painted. Seeing that I already have some standard Necromancers (and Liches), with those I decided to make them a little special, with some additional theme than just 'an evil old guy'. The first one shown here is Alarich Schwering, the most converted one, one that studied Lore of the Beasts besides his standard necromancy. I envision him in my background stories as a crazy, wild survivalist and to give him an appropriate look I made him a sabretusk pelt - out of Ogre Ironblaster bits and some greenstuff. As for the second one, Matthias Schwarzfeuer, I got inspired by THIS miniature to make him really fancy, rich and extravagant - a necromancer that wants to break with the 'dusty old man' stereotype. It's mostly about painting, so not very much of that idea is visible now but I could still give him a fancy Empire hat and some additional gems. And the last one, Ignatyi Ognemet, the least converted but also the one that started the whole idea of 'odd necromancers' in my mind. Long time ago, when I was reading 9th Age rules, I saw that they allowed necromancers to take Lore of Fire, which instantly gave me the image of a crazed bright wizard, only using green flames. I liked the idea enough to buy a box of Empire Wizards and build such a guy - he uses a flagellant head and some long hair to make him look more dishevelled. After that, I decided to add some theme to the two metal necromancers that were waiting in my drawer - which you can see above. Much later I saw that 9th Age got rid of the old WFB lores altogether, so even if I would play that system, he won't make much sense. No worries though, all three odd necromancers should be interesting to paint and that's all that matters. You could always find some sub-groups or themes in Constantin’s zombie legion, but at the end of the day, it’s still a chaotic, everchanging mass of reanimated bodies - some things just find themselves there without any great reason. Despite that, or maybe because of it, they fit with the rest just fine. First is the filler with the Terrorgheist head, probably the most humorous part of the whole horde. The idea came to me when I got an additional TG head in a bought collection of bits - and where else could I excercise some non-seriousness if not with the zombies? Setting them up in this position was a bit challenging, but I think it all worked out rather good, considering those zombies have wonky anatomy either way. And the remaining singular zombies. Some of them are more interesting than others, like the headless flagellant, the armless one or the only undead greenskin. The rest are just the most common zombies that can be built from the old set - but those are needed too for real diversity after all. And that's it folks, the Legion is done. And for all the zombie fans, I'll be back with a giant and a dragon in the future - there are always more zombies to be built after all. Damn those are sick. Your conversions and use of bitz and parts are the best! I just picked up some cursed company for my army as well, get me some skeletons, have a converted skeleton skaven and daemon i should post sometime. The Assassins Astrys and Ezion are here - they are a part of the Dreadspear Dragons Blood Bowl team. Minis used are the official, unconverted Dark Elf Assassins from Forge World. They took more time than the rest of the team because all the glazes on their cloaks took much more time than I expected. I wanted to do something extra on them, but adding fancy freehands would just clash with their rather 'stealthy' look - so, getting inspired by the Forge World paintjob I decided to paint a gradient there, only making it a bit smoother and more pronounced than theirs. Other than that, they try to keep the same scheme as the rest of the players. Also - I know how bad reputation those poor Assassins have and how almost nobody likes to use them in the game, but the models are still good (especially the female one) and I considered them way too iconic for Dark Elves to just ignore them. We'll see how they'll fare on the pitch later! The usage of assassins has been steadily dropping during the last seasons, mostly thanks to coaches collectively deciding that they are just not that useful on the pitch. Still, some teams continue to use them - and one of them are the Dreadspear Dragons. Astrys and Ezion were brought from faraway lands (funny accents!) for two reasons - first, show the spectators some real, bloody Dark Elf play - and to secondly, actually stab some stubborn knuckleheads from time to time. Well, that and maybe throw a ball once a while. They might be rookies, but their acrobatics and incessant attempts at stabbing their opponents always bring eager spectators. And now, my third warband for Warhammer Underworlds, converted Steelheart's Champions, the Faceless. They are an effect of an idea I came up with maybe a year ago, to turn some of those golden champions into creepy and enigmatic knights in ornate, but neglected and faceless armor. The conversion process, both the design phase and the sculpting were the most taxing part of the whole project - you can see it all explained HERE, with all the inspirations, concepts and plans for the future. The painting process was much simpler in comparison. I used this image as a direct example of what I wanted to recreate, inspired by all the miniatures and artwork that gave me this idea in the first place. I started with a dark metallic base, added several layers and colors of rust pigments, then applied some additional shades and bright silver highlights. More typical painting work was used on all the fabrics and leather - and then also covered in pigments and sprinkled with washes to get the dirty look. They turned out mostly how I envisioned them - the only problem that I noticed is that they are easy to mistake on the tabletop when standing near my Garrek's Reavers - they are both dark, muted and dirty! Well, I'll have just to deal with it, because I don't want to change the aesthetic concept just for gameplay convenience! It always starts the same. First, all the vampires, undead, chaos worshippers, heretics and similar become too much for the nobles to deal with. Not wanting to use their own warriors and troops, leaving them weaker in internal conflicts, they instead organize a ragtag militia of peasants and poor townspeople to hunt them in exchange for money, titles and land. Those bands soon become obsessed with their mission of ‘cleansing’ Vechernya of filth, heretics, undesirables and they start a cult around it. Not long after that, strange knights start joining their ranks - ones that believe their purpose so much that they forge a whole military order around it. Frighteningly effective in combat, they achieve great results in fighting the dangers lurking in the land. All is well until they run out vampires and ghouls - then they start turning on the folk of Vechernya - slaughtering villages and burning people on the slightest of offenses. Growing in numbers, they soon turn out of control, forcing the warring dukes and nobles into forging an alliance and destroying them, usually at a great cost. Then, many years later the whole cycle will start again, spun by the dreams of the Withered King. This time the knights are known simply as the Faceless - they hide their faces and identities behind elaborate masks and helmets, believing their mission to be more important than their old personas. The fact that nobody ever saw their faces or heard them speaking and lived to tell the tale only strengthens their enigmatic and sinister reputation. Small, yet dangerous groups of those ominous warriors wander through Vechernya searching for any sign of corruption and heresy, no matter how slight or hidden. First all three faceless as the whole warband. They are all different and turned out pretty characterful, so below this one, you will find much more pictures of them individually. Now, all the members - first, the leader. I turned Severin Steelheart into the Crusader, an unrelenting champion fighting to purge Vechernya of all the undesirables. The piece of cloth (backskirt?) behind him was a perfect canvas to really try out some dirtying techniques, with pigments and washes. 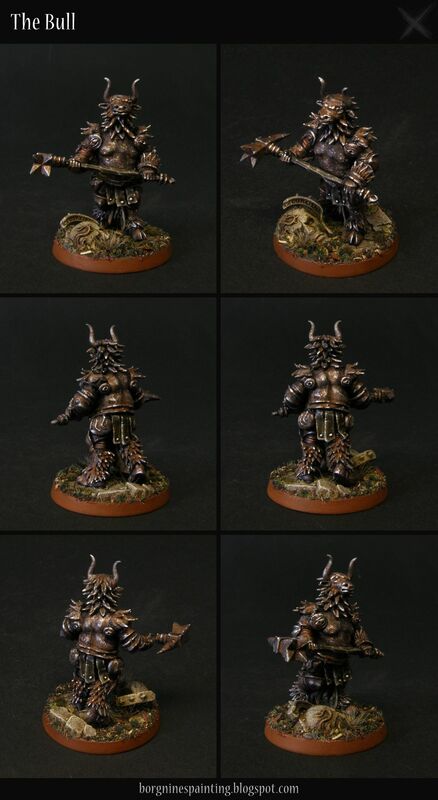 The next one is Obryn the Bold, which is known in my warband as the Bull - a very diligent, but impatient warrior. He was interesting to paint thanks to the combination of flat and highly sculpted areas on his armor. Weirdly enough, when I was reading the Shadespire cards recently, I was surprised to see that Obryn is described as "bull-hearted". Now I don't know if it subconsciously inspired me a long time ago (and/or I forgot about it) or if it was just an interesting coincidence. And the last one from the band is Angharad Brightshield, turned into the Vulture - a vicious warrior willing to prolong the fight if it means hurting and tormenting her enemy more. Her shield was a delight to paint (as wood usually is for me) and the freehands on the ribbons flowing behind her were a welcome variation from her freehand-less bandmates. I would love to have a much larger force of Faceless, but seeing how taxing and difficult it is to convert every single one of them, I probably won't be doing that very soon! 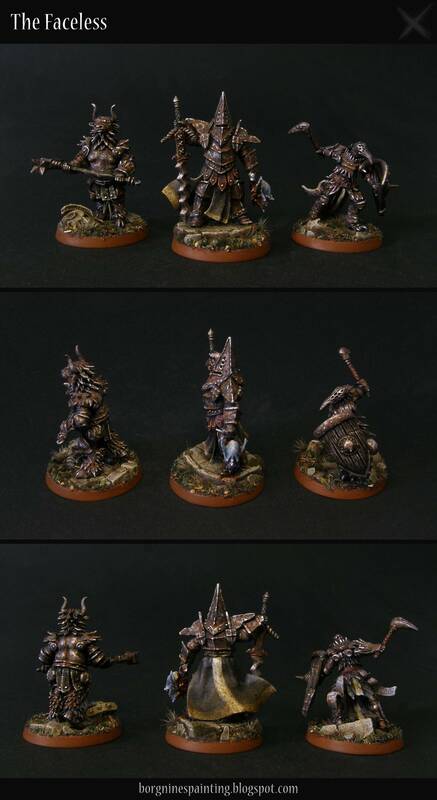 More awesome conversions! I love 'The Faceless' - everything from the conversions to the paintj ob has made these guys just about as different as they could look from the Steelheart's warband. Once again, some Blood Bowl update. Shortly after the Assassins come the Star Players - the last part of the Dreadspear DragonsBlood Bowl team - for now, at least. I have some inducements planned for the evil elves, but first I would like to actually finish the Nurgle team. The dragons may be a relatively fresh team, but they do employ star players from time to time. One of them is Roxanna Darknail, a big druichii star. She took a liking to the team’s pet dragon - and while she didn’t want to participate in the wreck that was the previous iteration of the group, she is eager to help now that the things are better. The other one is much less known, but very important for the Dragons - Torles the Unlucky, the last living member of the previous team, still donning the old armor. Although talented and skilled, he couldn’t completely avoid the mismanagement of the past - and kept getting injured on the pitch, collecting more and more injuries. Because of budget cuts - and because people wanted to see him - he was forced to play, no matter his health. Not that he complained - he was skilled enough to be useful and passionate about the sport. Then he would get injured again, starting the whole cycle anew. Soon, he made a whole career out of it - showing up on various pitches - to score against all odds and get injured spectacularly. Commentators still argue if he’s really unlucky or actually very lucky - compared to other elves in his position, he gets mangled more often, while actually not dying in the process! First one is Roxanna Darknail, an official and completely non-converted miniature from Forge World. She was a tough one - the most important part of her are her hair, the thing I often most struggle with. I tried to make them special with the white braids and some purple highlights, but I will leave it to you to decide if it worked well enough. Besides that, painting her was similar to the other Witch Elves. And the second one, a 'star player' built by me, created to commemorate a particularly unlucky Dark Elf lineman that my wife had in her BB video game campaign. I kitbashed him out of various bits, greenstuff and other random objects that were laying around my workshop - you can see the WIP version HERE. Painting him was nice enough, but the most interesting part was easily the cast on his leg - I painted various signatures there, from his team-mates to famous Blood Bowl personas from the game lore. Usable by Dark Elf and Elven Union teams.